An all-natural, high-potency extract of Pomegranate to help protect your body from free-radical damage - without the sugar, additives or calories typically found in Pomegranate Juice products. POMEGRANATE 40:40 COMPLEX provides a unique, ultra-high potency, standardized extract of Pomegranate fruit’s most beneficial constituents. Pomegranate has long been referred to as the "sacred fruit" and has been used traditionally as a folk remedy for centuries. Pomegranate is an exceptionally rich natural source of a broad range of powerful anti-oxidant compounds referred to as polyphenols. Extensive positive research has caused Pomegranate to become an extremely popular supplement ingredient and fruit juice, but there is more to making a quality Pomegranate product than drinking a high-calorie juice or placing some dried Pomegranate fruit in a pill. 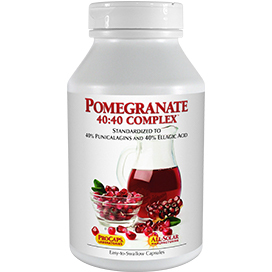 Our POMEGRANATE 40:40 COMPLEX uniquely provides an exceptional 40% standardization of Pomegranate’s two key beneficial compounds: Punicalagins and Ellagic Acid. These naturally occurring components in Pomegranate establish the standards upon which the quality of a Pomegranate product can be judged. Sadly, most Pomegranate supplements or juices are either not standardized at all or standardized for only one compound. Moreover, some Pomegranate is "spiked" with non-Pomegranate Ellagic Acid making it anything but a naturally beneficial Pomegranate product. The name of our POMEGRANATE 40:40 COMPLEX describes it well, since the "40:40" refers to the fact that our Pomegranate is uniquely standardized to contain both 40% Ellagic Acid and 40% Punicalagin assuring you of its natural and comprehensive quality. Each easy-to-swallow capsule of our POMEGRANATE 40:40 COMPLEX ensures the highest quality standardized Pomegranate extract without any of the sugar, calories, sweeteners, preservatives or other additives typical of Pomegranate Juice. 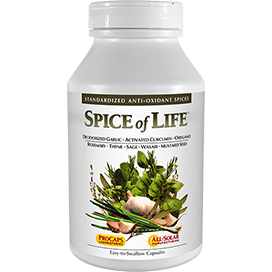 Consume one or two capsules daily or as recommended by a health care professional. 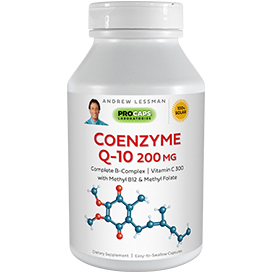 This product is most effective as part of a healthy diet and active lifestyle, along with one of Andrew Lessman’s multi-vitamin-mineral formulas. I started taking this for Hot Flashes. I read online it worked for that. I was skeptical but thought what do I have to loose. I was miserable. So far so good. It has been working for me. I take 2 caps per day. Not supposed to use soy since I am hypothyroid so that's why I'm not using Women's Wellness. I'm glad I found something else that works besides bioidentical progesterone cream. I do like the juice, but it is very sweet, and high in sugar. This way I can get the benefits without the calories and sugar. This is another of those at last its here. The benefits of pomegranate and ease of just taking one of these caps. This delivers so much and I am so glad I don't have to resort to juice or the messier job of trying to eat one. I had read that pomegranate can inhibit prostate cancer cell growth rate, avert lung cancer, inhibit breast cancer cells, may also fight colon cancer, promotes wound healing and can remove plaque from arteries and the list just goes on. 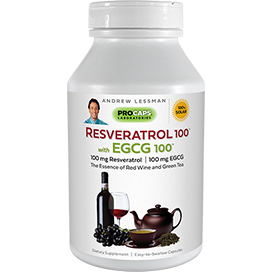 With all these benefits, this is a fantastic supplement that I've added to my other Andrew Lessman supplements and the fact that he's paired it w/Resveratrol makes this an asset to everyone's regiment! I didn't like drinking the juices because they're all so sweet. This makes it so much easier for me to get my daily intake without the effects of sugar! I so highly recommend this as I've been taking it for over a week now and feel so much better I can't believe it! Do not ever get rid of this Andrew! Thanks for bringing us such a fantastic product once again! 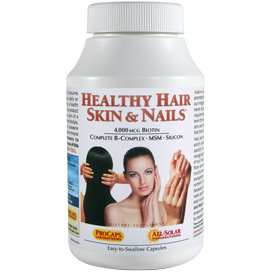 I started taking this product when it came out on HSN. They are very easy to swallow. You can't beat the benefits you receive taking this product. I'm going to put on AutoShip so I will always have. Hope you come out with Acai Berry. Thank you Andrew for not putting additives in your vitamins. My husband and I have been taking this product since it was introduced. I appreciate all of the wonderful benefits that this has to offer. 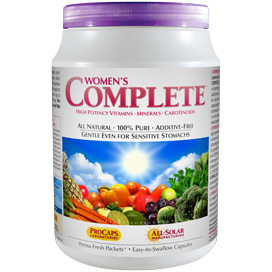 The capsules are extremely convenient to take. Thank you Andrew for another wonderful product. I’ve tried a lot of hi-end pomegranate supplements. This one is by far my favorite. The others seemed to cause unwanted side effects. I guess it must have been from their additives. I really appreciate the fact that you don’t use additives. I was skeptical about this product, but now I’m a HUGE fan! 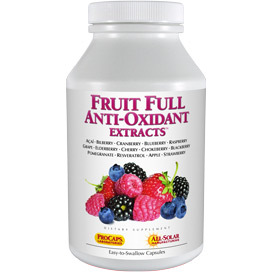 You can’t beat the other antioxidants that this supplement offers! I can’t wait to try more of your products. Please come out with an acai berry product.